Add traction to your step, thanks to millions of nano-sized spikes. 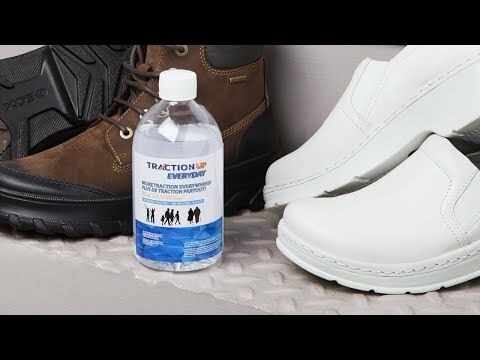 You apply this non-toxic shoe grip solution to your soles. 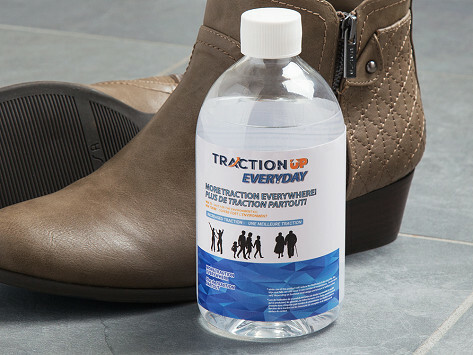 It dries into a grippy-but-clear surface that you won’t notice is there and reduces the likelihood of slips and falls in boots, flats, or high heels. Worked Great on all my families footwear! Got this product as a gift from my husband last April. I decided to try my husbands running shoes first - treated them for the 12 hours and12 hours and was so surprised with added grip the product gave his shoes. I then treated our child's 2 sets of shoes at once - again I left for the 12 hours and the same thing happened. Our little girl loves the extra grip. I was then convinced to try them on my shoes. I first treated my running shoes and I can feel the added grip. I then treated 2 pairs of my high heels and there is a huge difference in grip! We still have 1/2 the bottle left and will retreat all the shoes over the winter. I followed the directions for use. I used on 2 different pairs of shoes and it did not work on either one. a total waste of money. Whether you’re walking, running, dancing, or hiking, this concealed formula is an easy, low-profile way of staying safe when you’re on your feet.